Niki de Saint Phalle was born Catherine Marie-Agnès Fal de Saint Phalle in 1930 in France into a life of wealth and privilege. Her father was a French aristocrat and her mother a wealthy American. The family was wiped out financially, however, during the Great Depression and immigrated to the United States. In New York, young Catherine, now going by Niki, adapted to life on the Upper East Side, attending a series of private schools from all of which she was expelled for insubordination. She eloped when she was 18 with the 19-year-old musician/novelist Harry Mathews, who took her to Cambridge where he completed his studies at Harvard. A beautiful young woman, de Saint Phalle modeled for Vogue, Harper’s Bazaar and Elle and appeared on the cover of Life magazine. She and Mathews returned to Europe in 1952, where they both developed their cultural lives. In Paris, de Saint Phalle functioned as a liaison between the European and American art worlds. She met the American poets John Ashbery and Kenneth Koch, and the American artists Jasper Johns, Robert Rauschenberg and Larry Rivers. She was championed by Pierre Restany, the critic behind the “Nouveau Réalisme” (New Realism) movement, a French version of American Pop art. Among the Nouveau Réaliste artists she was associated with were Swiss kinetic sculptor Jean Tinguely, whom she later married; Christo; Yves Klein; and Arman. De Saint Phalle caused a sensation with her “Shooting Paintings.” For these performance-based works, which she made from 1961 to 1963, she attached balloons filled with paint to canvas and then shot them with a rifle so that the paint dripped out in a parody of action painting. During these years, she also designed sets and costumes for the ballet and theater. In 1965, inspired by a friend’s pregnant form, de Saint Phalle started making her “Nanas,” zaftig but contemporary earth mothers. (Nana can be translated as “chick” or “babe.”) Her most famous Nana, “Hon” (Swedish for “She”), also caused an international sensation. A 1966 room-sized reclining woman installed in the Modern Art Museum in Stockholm, it could be entered between the legs. In 1967-68, de Saint Phalle and Tinguely collaborated on a major work for the French Pavilion at the Montreal World’s Fair. In 1982, they also collaborated on the Stravinksy Fountain adjacent to the Centre Pompidou in Paris. De Saint Phalle’s major effort at the end of her life was the “Tarot Garden” she created in Tuscany. For more than 20 years she worked on a project blending art and nature that had been a goal of hers since 1954 when she saw Gaudi’s Parc Guell in Barcelona. In 1994, de Saint Phalle moved to San Diego. In 2000, she received the Praemium Imperial for Sculpture from the Japan Art Association, one of the most prestigious awards in creativity in the world. She died in San Diego in 2002. Marcelo Zitelli, trustee of the Niki Charitable Art Foundation, talks about the new Niki de Saint Phalle sculptures at the Missouri Botanical Garden. Marking the opening of “Niki in the Garden” at the Missouri Botanical Garden, St. Louis Post-Dispatch Visual Arts Critic David Bonetti surveys the life and work of Niki de Saint Phalle, from her early association with the French Nouveau Réalistes and her sensational “shooting paintings” to her Nanas, the Tarot Garden in Tuscany, and other spectacular sculptures. 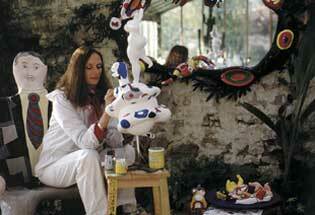 The photo here shows Niki de Saint Phalle painting “Le Monde” in her studio in France circa 1981. Bloum Cardenas grew up seeing her grandmother creating. And when Niki de Saint Phalle began a round, bright female piece called “Clarice Again,” Cardenas watched it in the yard and painted and colored a smaller version of her own. On Sunday, April 27, Niki in the Garden officially opens at the Missouri Botanical Garden. Guides and signs will let people know exactly which ones are meant for looking and which are built for climbing. Since 2001, the garden has brought in outside art, including Chapungu, stone sculptures from Zimbabwe, and most notably the glass creations of Dale Chihuly. But nothing has invited participation the way Niki has. On Sunday, Kim Treff of St. Louis watched as her daughter, Greta, 3, climbed around one of two giant, mosaiced lions. Treff loved the colors, the size and how her daughter could explore it, she said, but it’s not something you expect to see here. Because of that, Lynn Kerkemeyer, special exhibitions manager for the garden, wasn’t sure what people would think of Niki’s pieces, all sculptures made of fiberglass and mosaic or painted polyester. They explode, she said, with color, light and brightness. Already, though, “we’re just seeing people of all ages absolutely loving it,” said Karen Hagenow, public relations coordinator with the garden. All 39 pieces (the two lions are considered one piece) were created by Niki de Saint Phalle and cost about $1 million to bring in, including installation and shipping, Kerkemeyer said. Most of that amount came from donors and corporate sponsors. The French-born, self-taught artist and only female member of Europe’s New Realist movement made the sculptures of animals, totems, women, or “nanas,” and black heroes before her death in 2002. She was 71 at the time, suffering from emphysema, a result of breathing polyester fiber early in her career. Her work is featured around the world, including in Italy, Jerusalem and California. And often when making the animal and totem sculptures, Cardenas said, her grandmother was thinking of children. But the exhibit, which runs through Halloween, isn’t meant just for kids. Read the exploits of Cavi and the Giant Skull. Past stretches of green grass at the Missouri Botanical Garden, around open tulips and emerging tree buds, sits a giant skull. Flashes of greens and yellows, oranges and reds pop out from glaring eye sockets. Nearly every inch sparkles under the Sunday sun. Three of them. Through the ear-like archway, Cavi Wilson listens as his words bounce from shiny spot to shiny spot, back into daylight through the space between bared teeth. Cavi, 5, stares up into a ceiling of blue glass circles and a white half moon. They tilt their heads back, looking. 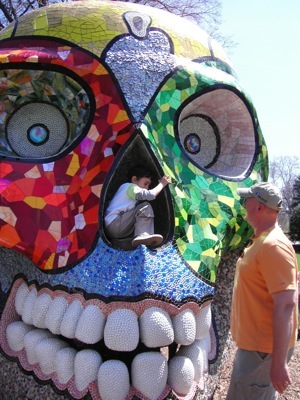 Brent Wilson, of Kirkwood, looks on as his son, Cavi, 5, gets comfy inside the nose of ‘La Cabeza’ at the Missouri Botanical Garden. And what about from the nostril cavity, all stony bumps just right for sitting? Or those eye sockets, where you can perch, knees tucked under chin? So the sometimes-shy Kirkwood preschooler climbs and plays and touches the pop art of Niki de Saint Phalle, the centerpiece of the Missouri Botanical Garden’s “Niki in the Garden” exhibition. It was Cavi’s idea to come here. The garden’s one of his favorite places, though usually, other than the Children’s Garden, he can only run across the grass and scuff his shoes on low limbs. This is different. Like Niki’s work, the day offers something quite unexpected. Inside the skull, called “La Cabeza,” Cavi’s family listen to their voices echo. “Hey, this skull is pretty dangerous,” Cavi decides, fixing his body in front of slick, nubby teeth where he can see a strip of grass, knees and bellies. Cavi pushes his skinny arms through and growls at people passing. Most of them stop, eyes big, then step up and touch and duck inside. Mrs. Wilson, however, wasn’t a fan, at least not at first. When she saw one of the sculptures outside the garden, she couldn’t imagine how these bright things would fit with nature. Soon, though, as she sees the works’ context and placement in the Garden and as she begins to connect with some of their spiritual themes, Mrs. Wilson decides she likes the work after all. Cavi likes it, too. It’s scary, but he isn’t scared. “Everyone thinks the skull is talking,” he calls to his parents from his spot in the mouth, where little faces frequently peek in. Then, he stretches his arms out for another growl. That night before dinner, Cavi and his dad sit down at the coffee table in their living room. Together, with fine-tipped markers, they draw the giant skull. When he gets time, Cavi plans to fill in the background with scenes of the garden. No doubt, a shiny skull is a strange thing to find there. But, in Cavi’s picture and at the garden through the fall, it’s exactly where something unexpected, and maybe a little scary, waits. Coming tomorrow: Learn about the artist, Niki de Saint Phalle, and more about the exhibit. “Niki in the Garden” opens this coming Sunday and runs through Halloween. While La Coupole in Paris is showing photos of Niki de Saint Phalle’s Tarot Garden in Tuscany, there’s no reason for kids to feel left out. 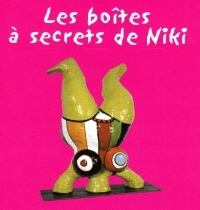 “Les boîtes à secrets de Niki” has its opening Wednesday 16 April at the Musée en Herbe, the beloved children’s museum in the Jardin d’Acclimatation of the Bois de Boulogne. The exhibition, presented with the generous support of the Mayor’s Office of the City of Paris, will be on display through 2 January 2009. The Musée en Herbe is located in the 16th Arrondissement of Paris (Métro Les Sablons) and is open from 10 am until 6 pm, seven days a week. For information or reservations, you can call them at 01 40 67 00 37. A stunning exhibition of photos of the Tarot Garden, the extraordinary sculpture garden created by Niki de Saint Phalle in Tuscany between 1978 and 2002, opens tomorrow at La Coupole in Paris. “Niki de Saint Phalle: Le Jardin des Tarots” features 37 large-format photographs by Giulio Pietromarchi and Laurent Condominas. The show will be on display at the Parisian landmark from 16 April to 15 August 2008. If you’re in Paris, you’ll definitely want to check it out. There was a six-ton skull rolling down the interstate Friday morning from Troy to St. Louis. 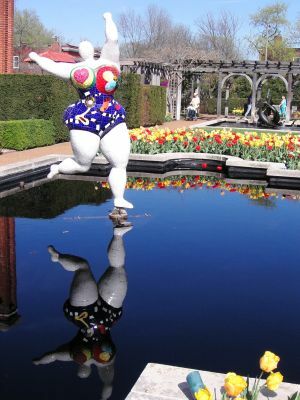 The Missouri Botanical Garden is getting ready for an outdoor exhibition of work by artist Niki de Saint Phalle. 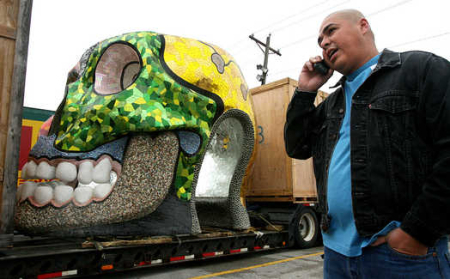 One of her pieces, La Cabeza, is a six-ton mosaic skull that was hauled to the gardens Friday on a flatbed semi. It drew a few looks as it traveled from the Chicago area on the back the truck driven by Juan Arcuelo, of Elgin. He stopped in Troy on Thursday night and had to avoid downtown St. Louis and rush hour with the oversized load. He traveled from Troy to Interstate 255 and then across the Jefferson Barracks Bridge near Columbia before looping back up to the gardens. The exhibit runs from April 27 until Halloween.